A Chinese boy has amazing eyesight because he can see at night and his eyes glow in the dark like cats. 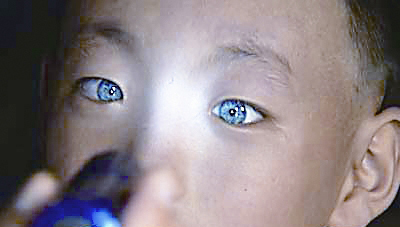 Nong Youhui has blue eyes and has reportedly been able to read perfectly in the dark and sees clearly as most people during the day, medical tests showed. Health experts in China say a boy has developed a rare condition where he can see perfectly in near pitch black conditions. Dubbed ‘Cat boy’ by UK’s tabloid The Sun, medical tests showed that Nong Youhui can read perfectly without any light and sees as clearly in the dark as most people do during the day. News first broke of Nong Youhui’s cat-like eyes in 2009 when the boy’s father, Nong Shihua took him to a hospital in Dahua, southern China as he was worried about Youhui’s bright blue eyes. Early this year, an eye specialist visited the boy in his home village to examine his eyes and documented his visit. Nong Shihua, the boy’s father, said doctors told him not to worry about Youhui’s eyes and that they would be fine as he grew up. Nong observed that his son’s eyes remained the same colour over the years but did not seem to harm the boy. The family soon got used to the abnormality. When the boy was in school, his teacher noticed that Youhui squinted and complained about blurry vision in bright light. One of Youhui’s friends told the teacher that his eyes were like a cat’s and that he could see in the dark. Intrigued, the teacher shone a torchlight in Youhui’s eyes and they flashed. He then invited the boy to catch crickets at night. Without using a flashlight, Youhui managed to catch some. Rumours of his ‘gift’ soon spread and a few reporters got him to do tasks in a dark room, including answering some math questions. Not only did he see in the dark, he also answered all of them correctly. Experts believe he was born with a rare condition called leukodermia which has left his eyes with less protective pigment and more sensitive to light. In a YouTube video uploaded on January 20, 2011, the specialist shone torch light in the boy’s eyes and they allegedly emitted blue-green light. Unfortunately, this is not clear in the video. The video – titled “Alien Hybrid or Starchild discovered in China? 2012” – also shows footage of the boy’s father and teacher who gave more information on the boy. This entry was posted in Info, Wonders. Bookmark the permalink.